Early today party faithfuls, supporters and volunteers of the Presidential Candidate of Alliance for New Nigeria Mr Fela Durotoye received with great joy the unveiling of the running mate. This event according to the Director General of the ANN 2019 Presidential Campaign Mr Lanre Oyegbola marks another milestone in the journey to the 2019 General Elections because the choice of Mrs. Khadijah Abdullahi-Iya presents the Alliance for New Nigeria greater foothold in the Northern part of Nigeria. Khadijah Abdullahi-Iya is an Award winning Innovator, a Serial Social Entrepreneur, Publisher, Mentor, Author, and a Social change actor, passionate about her community, and doing something about it. A lawyer by training, she holds an LLB Law from the University of Abuja and Masters in Law & Diplomacy from the University of Jos, and has made continuous learning, focus & determination as her strategy to personal growth and development. Khadijah has founded a variety of social enterprises & businesses. Notably, she is the Editor-in-Chief /CEO of S. I. Magazine Ltd and an Executive Director of Beyond Mentors Inc. She sits on the Board of a few SMEs and possesses over Ten (10) years experience in humanitarian and community outreach programs. Khadijah Abdullahi-Iya consults and facilitate programs and trainings for SME’s in collaboration with Governmental/Non Governmental Agencies or organization. As the founder/Executive Director of Beyond Mentors Inc. a non-Governmental organisation originally set up as a social enterprise has evolved to an NGO- Beyond Mentors Community Care Initiatives (BMCCi) which was conceived out of the need to address and prevent poverty from the cradle in Nigeria especially, Northern Nigeria. BMCCi has an advocacy arm called the Women community of Africa(WCA). She Created, Established & launched Rags to Riches (R2R) club in schools in Abuja, the club is inaugurated in Eight public schools in Kaduna state extended to out of school programs (IDP Schools) in collaboration with Life Builders Initiatives another NGO in Abuja. R2R has grown to over 181 members. Khadijah's objective & belief is to keep finding innovative/creative ways to add value to community; advocating for literacy through fun learning from the cradle, Which earned her an award for Excellence; for promoting quality Education In Nig, from the Civil society Action coalition on Education for all (CSACEFA). Her life’s goal is to chart a legacy through social impact. 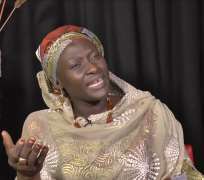 Fela Durotoye's decision to pick Mrs. Khadijah Abdullahi-Iya as his running mate is both a fulfillment of his promise to pick a female vice presidential candidate and a statement that affirms the theme of the campaign - Opportunities for All and the position of Alliance for New Nigeria in ensuring that women have equal splits and representation and not the meager 30% of the old establishment.